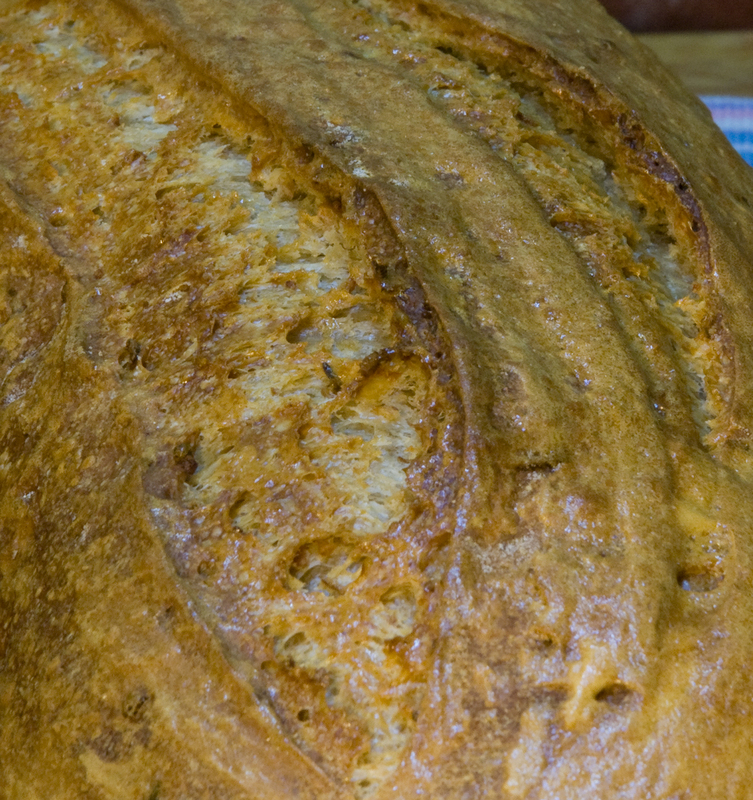 This is the second loaf I made last night after my Buttermilk Porridge Bread. I have to say, even though I didn't use a rye starter but rather my everyday AP starter this came out excellent. You can really taste the Guinness and onions in this one. The only thing I might change for next time is to add some caraway seeds. I brought one of the loaves into my office and everyone seemed to love it and several people requested a loaf for themselves next time :). If you are looking for a nice Jewish type rye than this one won't let you down. Soak the dehydrated onions in the beer for about 15 minutes. Mix the flours, rye chops and beer together in your mixer or by hand until it just starts to come together, maybe about 1 minute. Let it rest in your work bowl covered for 20-30 minutes. Next add the salt, starter (cut into about 7-8 pieces), and Walnut oil, and mix on low for 6 minutes. Remove the dough from your bowl and place it in a lightly oiled bowl or work surface and do several stretch and folds. Let it rest covered for 10-15 minutes and then do another stretch and fold. Let it rest another 10-15 minutes and do one additional stretch and fold. After a total of 2 hours place your covered bowl in the refrigerator and let it rest for 12 to 24 hours. And your ideas are great. 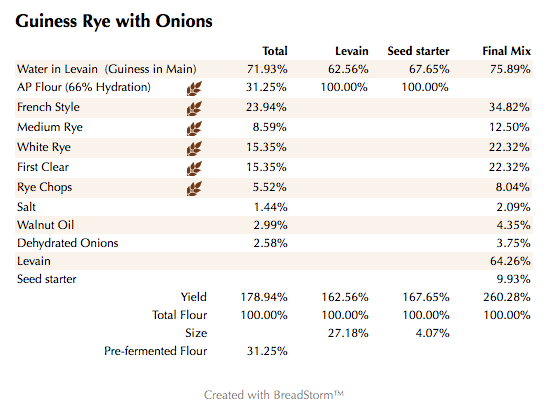 Guinness rye with onions. I can only imagine these flavours all working together. What a great bake. Thanks Abe. Hope you try this one as I'm sure you will enjoy it. 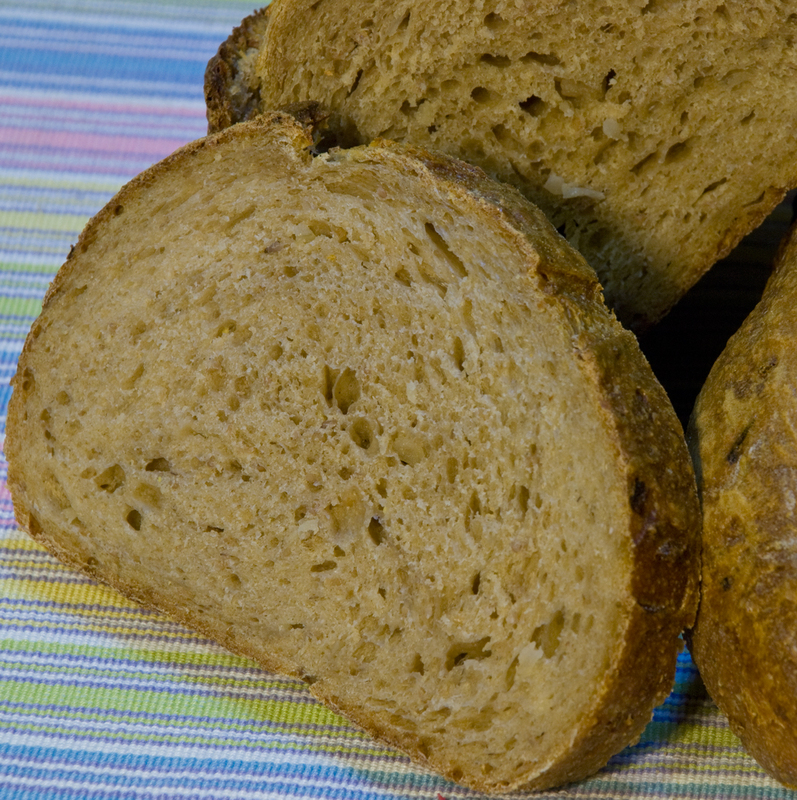 a Jewish Deli Rye but is nice to have one without them sometime, The crumb on this one came out perfect. Now all you need some smoked pastrami and some fermented cabbage! Lucy loves this one and will post her Guinness sprouted SD later today. 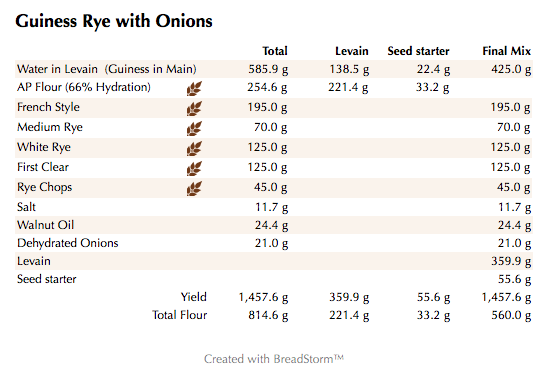 and bakeries will throw in caraway seeds and think this makes it rye bread. Tell Lucy we're looking forward to her blog on today's bake. Thanks DA and Lucy. Yes to the smoked pastrami but I'm not a fan of Kimchi! 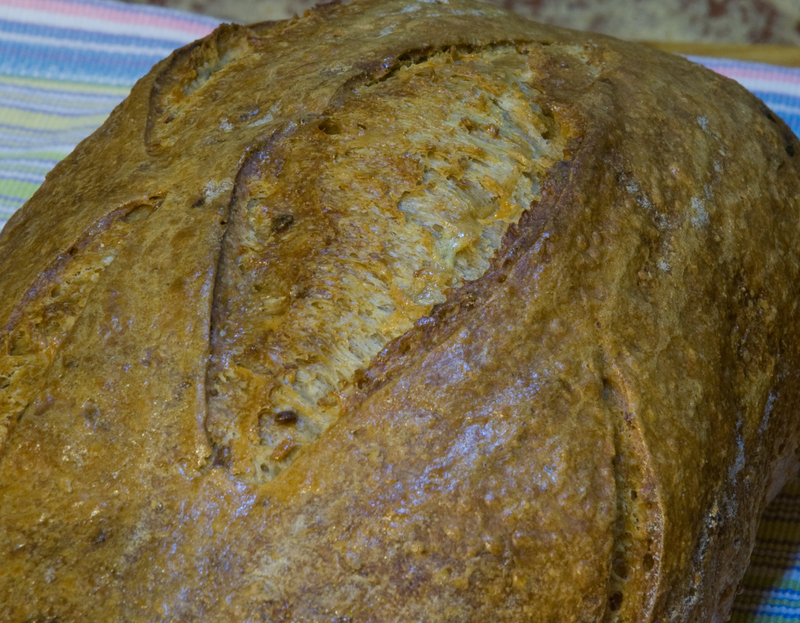 give this one a try one day as it really tastes great caraway or no caraway. Loved your Guinness bread as well. 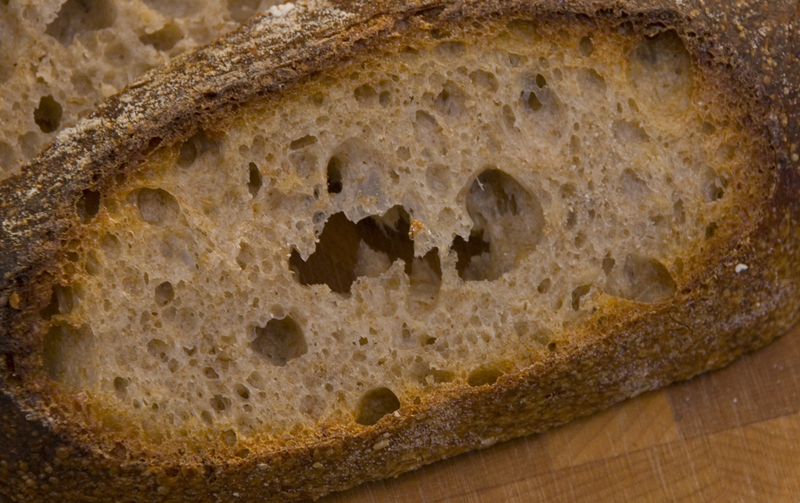 The crumb look great, and I'm glad that you don't think Jewish rye must have lots of caraway. this one makes a mean sandwich and toast with a smear as well.